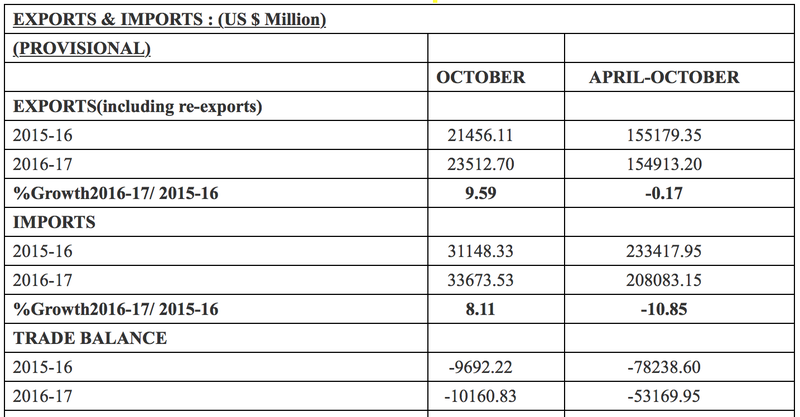 Exports have finally started to look up. While there is certainly base effect in play due to continuously decreasing exports for last two years, I have a hunch that we have hit the nadir and things will languish at this level or they might slowly (and very very slowly) start looking up as time passes. Till then, we shall have this silly increase and decrease of exports which do not carry much significance. The global trade scenario has not improved. While the sentiment for more trade has mellowed down across the globe, there has to be a point which can be called lowest. Probably for India, this was it. Now the question is, how to climb back from this valley we find ourselves in. GST will be rolled out sometime during April to October 2017. This would be single most radical reform of last decade. While the GST model law has been published, further procedures are being worked out in various committees formed for specific purposes. This post (and a couple more in continuation) would analyse, in a preliminary way, as to how the GST might impact Foreign Trade Policy (FTP) and the schemes therein, and some analysis based on the information available at this time. Assuming that the reader is aware of FTP schemes and basics of GST as outlined in the GST model law, I would proceed. The duties at the border would be collected by customs, i.e. central government, and the state share of the IGST collected at border would be transferred to the state where the imported goods are finally consumed. (Article 269 A. (1) - Explanation I). To this extent, states would also be directly getting a part of import duties levied at border, which was not the case till now. As centre and states both lay claim to IGST collected by customs at the border (as with inter state transactions), any exemption or modification in rules would have to be agreed to by the centre and the states. Border exemption of duties lie at the heart of some of the popular schemes of the current FTP. The exemption would be challenging if IGST is viewed strictly in the light of Article 269 A.1 - Explanation I. That would make any exemption at border, in the current form as outlined in the FTP unimplementable under GST regime. The problem can only be overcome with the agreement of, and a push by, the GST Council. States have an important say on the matter and to that extent the job is tough. There is no clarity as of now if it would agreeable to states. Or if such exemptions at the border are being considered at all. To that extent, the current FTP's exemption schemes' fate hangs in balance. The thinking in policy circles is to minimise exemptions as far as possible, and go with the refund route wherever necessary. Exports would be zero rated, which means taxes are not intended to be exported, and therefore all taxes paid on exported products would be refunded/credited (and not exempted) to the exporter. There is no doubt that exemptions would be preferred over refunds by the trade, due to obvious reasons of cash flow issues and time value of money. However, refunds are better from tax administration point of view. One needs to ensure that flow of refunds do not entail delays and harassment in GST regime. In order to circumvent the cash flow issue, there can also be an alternative approach where applicable exemptions are shown as credit entry against the importer, to be offset once the export obligation is completed. This way, the revenue collection agencies may show it as deferred collection at the same time not holding to cash flow of exporters who use imported inputs. Currently, under FTP chapter 3, various duty credit scripts are issued (MEIS/SEIS) which can be used to pay/offset duty liabilities at customs, central excise or service tax. Being transferable in nature, they are near money in market. CBEC has issued suitable notifications in this regard. There is no clarity if such scrips would be acceptable under GST. Assuming that incentive scrips would be made acceptable to offset atleast CGST and IGST part of liabilities, suitable mechanism in the GST network need to be made. The scrip should be designed in such a way that they enter into the credit account of the firm under CGST/IGST credit head. That way, the deduction would be automatic. The current cumbersome process of paper scrip being issued by DGFT, followed by online transmission to DG systems at customs is buggy and harassing. It is better for DGFT to migrate to GST Network and leave behind the legacy NIC software that it currently uses. As GSTN is a private non-profit company with shareholding from Centre and all states, there is no reason why DGFT should not dismantle its NIC gradually and move on to GSTN completely. Given the way it is formed, GSTN might prove to be more accountable in comparison. We may now look into the specific schemes under current foreign trade policy which might need readjustments under GST, assuming that indeed the GST council comes around to the enlightened view of exemptions at the borders for exporters. We need to also look at what other countries in similar situation are doing, but that would be in a later post. The current duty exemption schemes are Advance Authorisation (AA) scheme and Duty Free Import Authorisation (DFIA) scheme. Step 1: Get the advance authorisation issued from the DGFT and get it registered with the customs and execute a Bond/BG/LUT as applicable. Step 2: Import duty free inputs[This is point of exemption], incorporate into export products, and export. Step 3: Produce export documents to DGFT and get the export obligation discharge certificate (EODC) and produce it to customs to get the bond cancelled. The current interface between DGFT and DG Systems (ICEGate) is rudimentary. The advance authorisation details are transmitted to customs, but the exporter needs to produce the license physically at the port. The Bills of entry and Shipping Bills are not electronically linked to the EODC process at DGFT, leading to lot of avoidable paperwork. Two departments are involved in the process of implementation of this exemption scheme, and there is duplication in verification checks. Under GST regime, this scheme's survival depends on exemption agreement on various duties levied. If indeed total duty exemption is agreed upon, including exemption for IGST, this scheme may continue as is, with a new notification on similar lines as existing being issued in this regard. However, if IGST exemption is not agreed upon, or worse still, if exemption (BCD+IGST) at the border itself is not agreed to, and the council goes with only refund route, this scheme will get stunted or redundant, respectively. A new notification from GST council to replace the existing ones from CBEC with regard to this scheme. Integration of DGFT system with GST network. The exemption details under AA (credit note, direct exemption as in existing scheme or any other approach) and the debiting at the customs have to move online for smooth integration. 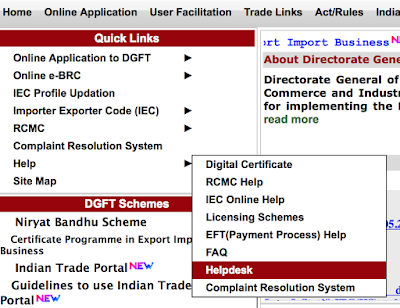 The EODC process needs to be integrated with GSTN feeding in the export data to DGFT system. This activity has to start at the earliest and should be a co-development with the same team that is working on GST network. Assuming that all states come aboard in the interest of exports, and agree to forego their share of IGST which would then be refunded to exporters by customs (similar to drawback mechanism currenlty), a mechanism would then need to be designed to allow faster and harassment free refunds under GST Network. A new notification on refund process and rate of refund determination. Rate of refund may be similar to drawback or may be linked to actual duty suffered, as the data would be readily available in the network. Verification method, checks to prevent diversion and documentary requirements for refund. eBRC, Shipping Bills etc. Same as Scenario B in terms of agreement, but the implementing agency would then be DGFT. FTP chapter 4 needs to be revisited to devise a mechanism to refund the duties suffered at the border. Refund may be upon production of Bills of entries, in the form of credit/scrip/cash, and the export obligation may be monitored by DGFT as usual post the refund. EODC may be issued after export obligation fulfilment, and in case of failure, refunded amount with interest would be recovered. Scenario C entails minimum tweaks in the FTP, where the border exemption is replaced with refund by DGFT and all other details (EO monitoring etc) remain the same. Rather than getting duty exemption at border, the trade would pay the duties there, and come with bills of entries to DGFT to get the refund. However, refunding through DGFT involves a different challenge altogether. Refund from DGFT would entail fund allocation for the purpose from Finance ministry, which involves budget approvals for withdrawal from consolidated fund of India. This would be tricky each year. Refund from tax collecting department is relatively easier to implement from this point of view, as the department that does revenue collection is the one that refunds, and thus it can do book accounting for refunds that flow out for a financial year. Advance authorisation scheme loses the charm as for most of the items currently the BCD is less than 10%; and if the imports are from one of the countries with which India has signed a free trade agreement, even this BCD might be near zero. This would effectively make the advance authorisation scheme redundant. One of the above four scenarios, or a mix of one or two above would play out in actual. The best case for the trade would be Scenario A if border exemptions are allowed, and Scenario C if refunds are chosen over exemption. The second part of the series can be found here. DGFT has come up with a series of video tutorials on their youtube channel to help newcomers in the area of international trade. The video series aims at providing the basic knowledge about fundamentals of international trade, such as introduction to incoterms, export import policy of India, starting an export business etc. As yours truly was deeply involved in the development of the project from the beginning, I thought of sharing some of the links here. The videos were developed in Bangalore DGFT office, and some more are in the pipeline for the beginner series. The videos will be accompanied on the official DGFT website with FAQs on various introductory topics in coming days. Given that e-learning has been popular for last few years, this initiative was designed to produce standardised, short and easy learning modules in the area of international trade from Indian perspective, keeping in mind the unique situation of an Indian exporter/importer. Feedback welcome on official youtube channel. Enjoy. IEC stands for Import Export Code. 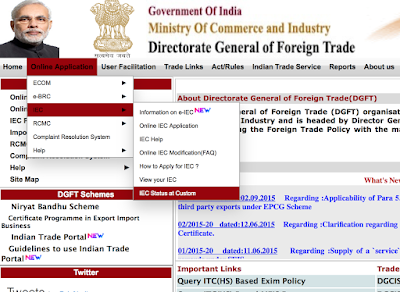 IEC is mandatory for anyone planning to carry out import export business from India. 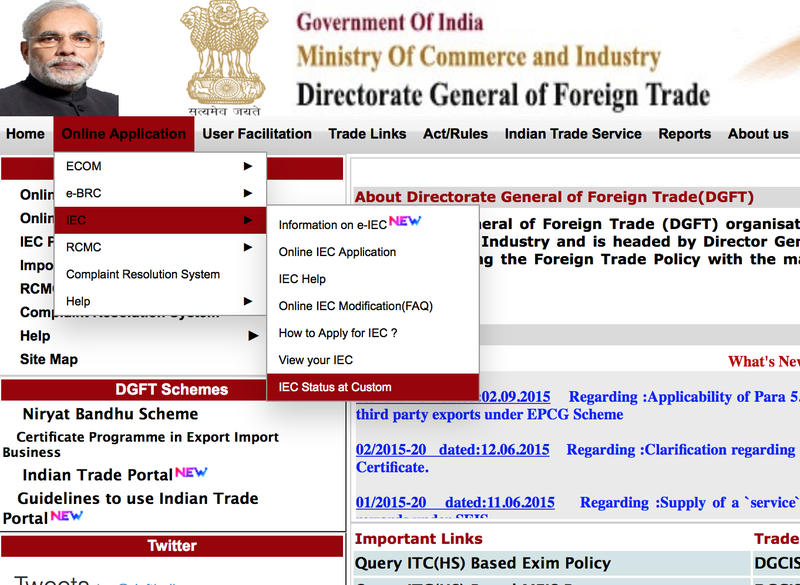 IEC is issued by Directorate General of Foreign Trade (DGFT, online. Earlier the IECs were issued through manual as well as online mode at the choice of applicant. However, since 1st April 2016, IECs are mandatorily to be applied and issued online. Post GST, since July 1st 2017, IEC numbers issued are same as the PAN numbers. Vide Trade notice number 23 dated 08 August 2018, DGFT has made it very easy to obtain an IEC for anyone having a PAN and bank account. The trade notice can be found by clicking here. With this, it is very easy to get an IEC. Once the application is submitted at this link by filling up required details, e IEC gets generated online immediately which then can be downloaded, printed and used. A random sample based inspection is carried out after issue by the department, and in case of any discrepancy, the applicant is contacted to provide further details or to rectify the documents. There is no need to go to the DGFT office anymore to get an IEC. You may apply for IEC by clicking at this link. 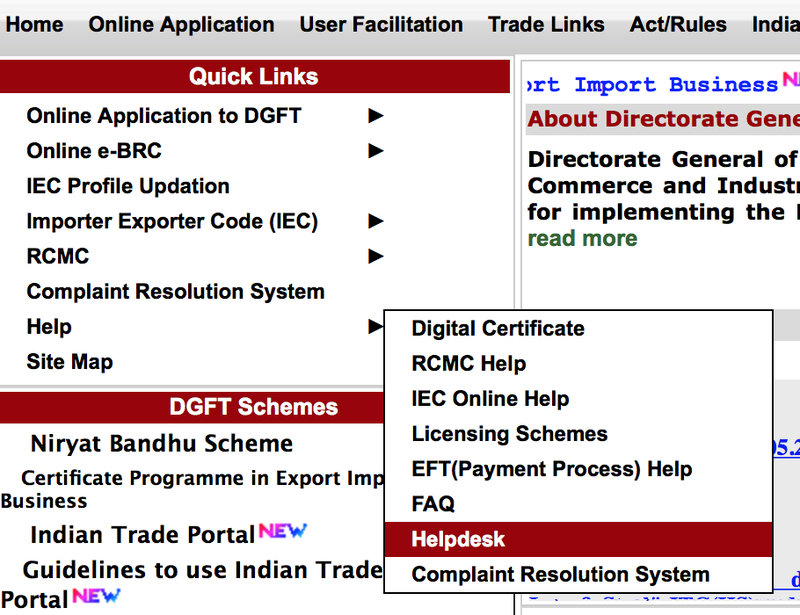 While one may point to the links at www.dgft.gov.in website, I thought of elaborating the application process here as the current DGFT website might be too cumbersome (and misleading at times!) for a new applicant. To sum it up, the following is the process to obtain the IEC code online. Obtain a digital signature (class 2 or class 3) for your self/organisation from one of the authorised agents of DGFT. Currently there are three: n-code, emudhra, and safe-script; who are authorised to issue the digital certificates. Keep the digital key active and ready when you wish to apply. You may refer the link here for more details on obtaining digital key. You need to keep two documents ready. A PAN card, and a cancelled cheque bearing pre-printed name on it. In case a pre-printed name cancelled cheque is not available, a banker's certificate would do. The format for banker's certificate is given in the last page of this document. Scan these two documents and keep them ready for upload. Scan a photo or keep a digital photo of the applicant ready. Keep an email id and mobile number ready. The details once keyed in will get locked with PAN number, so one needs to be careful and use correct email and mobile numbers. The digital tokens are sent to the email and mobile and needs to be used while logging in. Keep a debit/credit card with minimum balance of Rs 500 for fee purposes ready. Fee is to be mandatorily paid online. Internet Explorer (preferably version 11) browser. Chrome/firefox/safari etc won't work. Java version 7.51 with security settings low. Compatibility view settings to be changed as follows: Go to IE --> Tools --> Compatibility view settings --> under add this website add '164.100.78.104' --> Add and Close the menu. Add www.dgft.gov.in to trusted sites in security settings. Go to www.dgft.gov.in and navigate to IEC code online application as shown in the image below and click. Follow on screen instructions to log in and key in all the details. You may see the details of what needs to be filled in step by step here. You also need to pay the fee online during the application. Digitally sign and submit the application. Thereafter, an e-IEC would be sent to you on your registered email id and a confirmation sms would be sent to you on the mobile phone. The time taken is around 2 days to issue a new IEC code online. 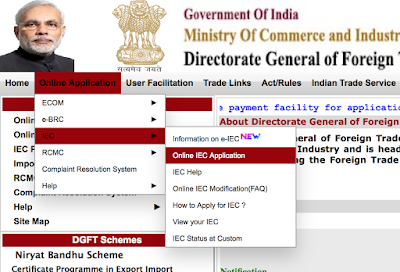 Also, once the IEC code online is issued you may check IEC code status 'View your IEC' at the DGFT website. Refer image below. Also, one may see the status of your IEC under 'online applications' --> 'IEC' as shown in the image below. For any further questions on this topic, you may leave a comment below. India has taken the normal approach of hard-negotiating behind high tariff walls. India doesn't have much choice as we are, among the RCEP nations, stuck with high tariff barriers due to legacy revenue generation issues. India has calculated that it stands to lose 1.6% of GDP in revenue if she gives up on some of these high tariff barriers. It pinches India to give up these high tariff barriers when other countries don't have much to return due to their already low tariff barriers. 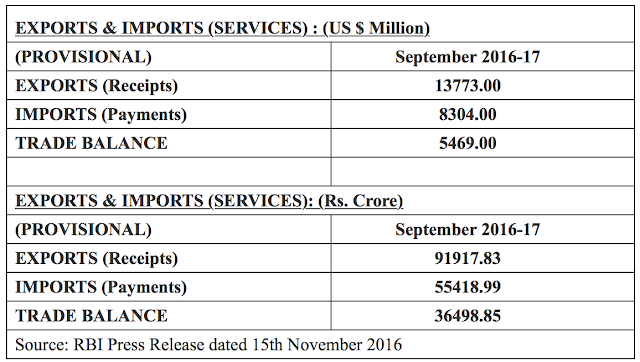 Therefore, in return to reduction in tariff barriers in goods, India is expecting others to reciprocate in services. The world has moved away from segregated model of manufacturing to global value chains in last 20 years, especially in electronics and complex engineering items. This means that manufacturing has been discretised and spread across countries. It is difficult to integrate into value chains if we stay behind tariff barriers, or non-tariff barriers arising due to poor infrastructure (especially ports), red-tape, lack of skilled labour etc. Integrating into value chains pulls you up in terms of technology, scientific know-how, processes and creates a demand for trained labour. The revenue lost due to reduced tariffs can be made up through corporate tax that arises due to higher manufacturing activities and profits. At times low tariff on imports, especially in electronics and IT hardware, feeds as input into IT services and therefore it helps another sector to compete better internationally. Other usual 'yay-free-trade' arguments based on trade theories. After careful consideration (rather re-consideration), and based on evolving trends in International trade area, I now think that it might not be in India's interest to get into RCEP. Or into any free trade agreement bilaterally or regionally. Basically, I am carefully retracting from 'yay-free-trade' to 'wait and watch' mode. World-over, the appetite to cooperate on matters of free trade is on wane. It has mainly to do with the continued subdued growth over last few years. The slow growth has hit the domestic appetite in developed parts, especially in Europe and US. The world trade has not grown as expected over last few years. The international trade growth has stagnated. The dry baltic index is languishing at the bottom for some time now. This might be an indication that trade has stagnated at last. Discretisation and china model has probably peaked and will either stagnate or deteriorate in future. While one may point at low commodity prices to be a factor, it cannot explain all the slowdown. And low commodity prices itself is a result of global slowdown, again pointing to a subdued sentiment. The evolving politics is not free trade friendly. The recently concluded Trans Pacific Partnership was opposed both by Republican (Trump) and Democrat (Hillary) front runners. While the speeches might not reflect what the candidates might do once in office, but it can be fairly surmised that they would not exactly be willing to use their fast-track powers, if renewed by congress. Non-tariff measures are on an increase in the last decade (India being one of the leading imposers of NTMs) as tariff measures have been negotiated away through WTO and Regional agreements. There seems no point in concluding more agreements when the intent is blunted through NTMs. There are countries that continue to operate under tacit subsidies, mainly China and US. The amount of support, both direct and indirect, to their industry that comes through cheap loans, better infrastructure, better government support through subsidies cannot be matched easily. The economies of scale Chinese enjoy due to this support in last couple of decades makes entry barriers steep for others. This leaves the competitors crippled. US (and farm sector of EU) is loathe to reduce their subsidies, while urging others to curb theirs. Lastly, the trade issues in goods have moved beyond the tariff reduction and comparative advantage. It is now more about regulatory and IP matter. While tariffs do contribute to much of the noise, the actual scenario in latest rounds of FTAs (TPP, TTIP) was more about arriving at regulatory coherence to ensure common quality and technical standards, common intellectual property regimes and common technology in order to arrive at better value chains. The idea, mooted by MNCs who want seamless experience while moving across countries, has gained traction. While there are fears that regulatory coherence of this type undermines multilateral (WTO) agreement, it needs to be seen rightly as next step of evolution in trading across borders. India still sticks to old school and is not comfortable with evolving IP regimes at regional levels, and is yet to get over the WTO IP agreement shock. On domestic front, India has some specific challenges which warrants a re-think on our readiness to get into complex Free Trade Agreements. India doesn't appear to be in a position to take advantage of any Free Trade Agreement that it negotiates right now. The existing FTAs can be written off as useless due to their abysmal usage in bilateral trade. What is the assurance that a new FTA, negotiated on similar lines, will be useful now. The very reasons that make the current FTAs unusable will continue to operate with RCEP and others. India lacks the infrastructure required to cater to increasing trade. Most of the ports are handled inefficiently and few of them are extremely congested. The roads are not yet world class. The industrial clusters languish in apathy. The red-tape and bureaucratic hurdles make things difficult. The contract laws and enforcement is poor. In short, doing business is difficult in India. This, is not the ideal conditions with which we can engage in international trade. We need to build the basics first. Till then, the WTO deal is good enough. There is a feeling in trade community that we have opened up our market with every FTA we have signed, and have got little in return. Therefore, FTAs don't make sense unless we get an incremental and meaningful market (over MFN status from WTO) for our goods in return. That's the general feeling and the point is moot, but clearly we are not moving in a direction that caters to the need of our industries through these FTAs. Hence the feeling. There is a need to develop a framework where the negotiating team involves industry and consumers, beyond seminars and touch-and-go interactions with commerce officials. The current touch and go interactions bring forth only the vested interests, with negative consequence of narrow protectionism. Our industry loves to stay infant. A 100 years old Tata rallies with a 50 year old Jindal and asks for anti-dumping on Chinese steel. We oblige. The industry loves tariff walls. We keep them. We have multiple market failures (monopolies/cartels, lack of pubic goods etc) and institutional weaknesses in our system. Our farm sector suffers from inefficient Govt. subsidy and procurement issues. Our policymakers still think of subsidies as the best way to address market failure. We lack good data on services. RBI, a central bank, is our data provider in this area. We are, in RCEP negotiations, leaning on something called 'mode 4' of services. Mode 4, for lay readers in simple terms, is sending our techies abroad to do coding kind of stuff. We have too many of them here. Our Wipros and TCSes have already reached wherever they could, even in China. We are asking for further ease of mode 4 movement. And we want easy visa with less fee. We are trying to get more mode 4 access in return for reducing tariff. It would have made a good joke but for a serious nation like India. If this is the line of argument, I infer that we have no idea how to negotiate with people whose tariffs are already almost zero, while ours is sky high in comparison. We change the goal-posts, and we want everyone to be in our game. Finally, our import tariffs generate a revenue of around 15% of total Government revenue. Now, I don't think there is any rationale to reduce it at any FTA, given our industry's lack of capacity to capture further markets abroad. While we better our infra, better our technology, better our labour, better our abilities, it is best to sit tight and not let others eat away our domestic market. Let our incompetents survive till they become worthy. Killing them by subjecting them to China or Korea is criminal. US thinks the same way about their industries now. UK too is forced to think similar. We need to think on the same lines too. Given the above, there is a need to re-look at the way we negotiate. The politico-bureaucratic setup currently is not designed to maintain continuity. While the political masters involved in negotiations change with elections, the bureaucrats change with central deputation postings. There is no permanent body at commerce that acts as institutional memory. The is a lack of knowledge management. It is upto individual bright sparks, who choose to come on central deputation, either to escape a bad cadre or due to genuine interest, to carry the baton. This approach, while manageable in last century, is no longer workable. There needs to be a permanent set of people whose career is trade matters and trade negotiations. 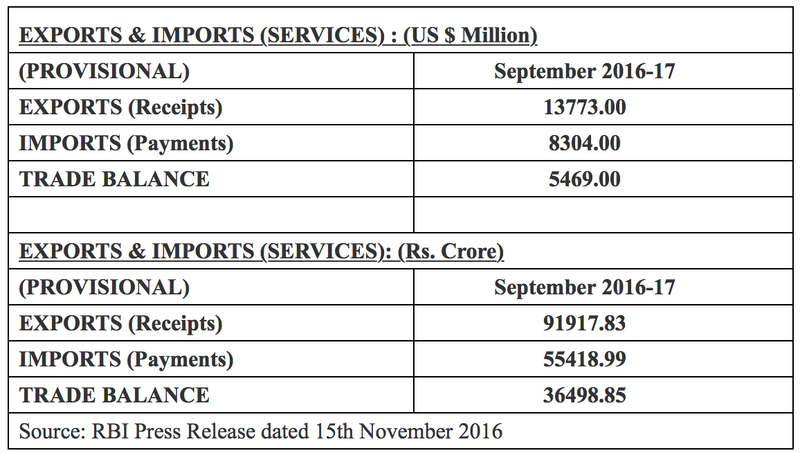 The commerce department under-utilises its captive cadre of Indian Trade Service. A relook is in order. Till we put our house in order, and get a clarity on trade matters, I believe going into RCEP is not a wise idea. There is hardly any incremental advantage that we would get. We may as well put it on hold or walk away. The cost might only be diplomatic. The trade cost seems almost nil in present circumstances. While the Govt. has put a number to revenue loss in case we agree to reduce tariffs (1.6% of GDP), it has failed to tell the public as to what would be the gain from this agreement in terms of numbers. We know how much we will lose, but we don't know what we would gain. That, according to me, is a poor start. The intention behind the above is to protect domestic steel industry. To that extent, the measures are succeeding. The local steel industry led by leading capitalists of the country is surviving if not thriving. The above measures were the result of effective lobbying by the steel industry. The same has repeated across many countries, like USA, in the recent past. UK too is now feeling the heat with Tata Steel pulling out of steel sector there due to cheap Chinese imports. Why is steel so important? The argument in general policy circles goes this way. One, steel sector is a strategic sector. Defence and infrastructure depend on it. Two, it generates big employment. Three, the sector has unionised labor. Government needs to appear to do something to help the ones that are running by not letting them close down. It is not unique to India, even UK is facing the same puzzle. The above policy circle argument needs re-examination. A globally traded commodity like steel cannot be strategic in 21st century. That was so during world wars. Indian steel is especially not so, given the poor quality of most of the mills (we import most of high grade stuff). The employment argument needs rephrasing. Supporting one job in steel mill might be costing two in the downstream engineering sector that uses steel. Downstream engineering sector is losing competitiveness/export potential due to costly steel, and it has already started hurting. The policymaker is put in a tricky situation due to global scenario. China has excess capacity in manufacturing steel which will continue for some time, till production in China falls, or their local demand picks up. There is a glut in global market due to this. The trade defence measures such as anti-dumping, safeguards, minimum import price etc are the measures at hand. One may impose one or several of them. The cost is the downstream sector and consumers. No one eats steel. It goes into infra, engineering, and goods. The question is about balancing the interests. While the policymaking-bureaucrat might play with data and study the export/competitiveness loss in downstream sector and so on, the actual decision is made at political levels which may not be influenced by such inputs, and is rather influenced by the heft of the lobbies. That is so everywhere. I feel that these times should be used to re-invent the steel sector. Rather than continuing the way it always did by hiding behind artificial barriers, the steel sector should look at reinventing business model. 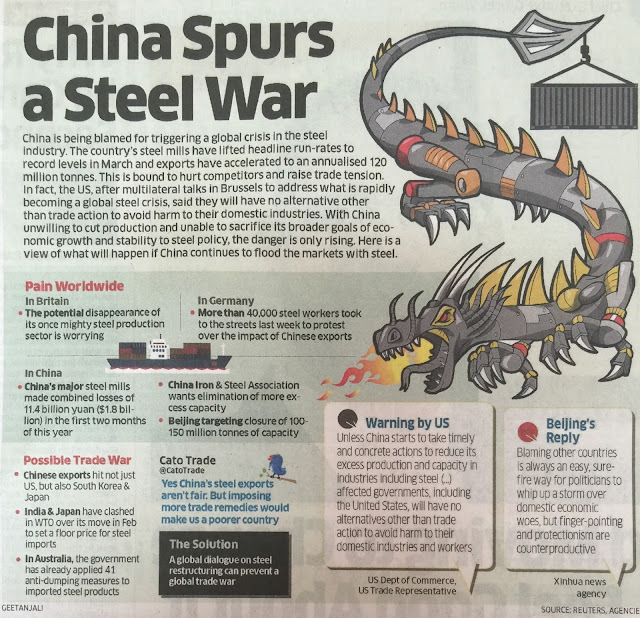 As TATA is selling out in UK, the steel sector there is thinking on those lines; splitting into smaller units specialising in specific high quality steels, using scrap as inputs and so on. The mammoth integrated steel plants in India produce soviet era steel at un-competitive price point. Policymakers should see how steel sector can be supported through better infrastructure, cheaper and reliable electricity (thus obviating investment in captive power plants), cheaper inputs, incentives for high quality and specialized steel and such measures. And they should let the rotten parts of the steel sector to totter.